1 pound of California pears distilled the brandy in each jar. 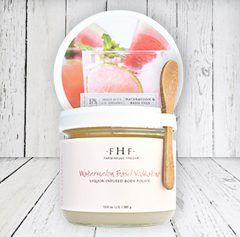 Smooth exfoliation with a spectacular fruity kick! 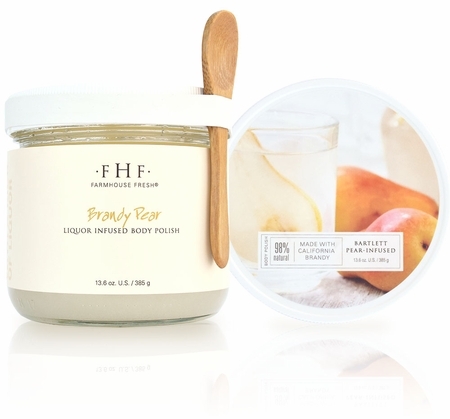 This decadent cocktail body polish is brimming with mouthwatering pear-infused brandy from Bartlett pears grown in California. Featured in Cooking Light Magazine for "nourishing your skin and keeping it smooth all winter long," the scent is ripe, sweet and succulent! 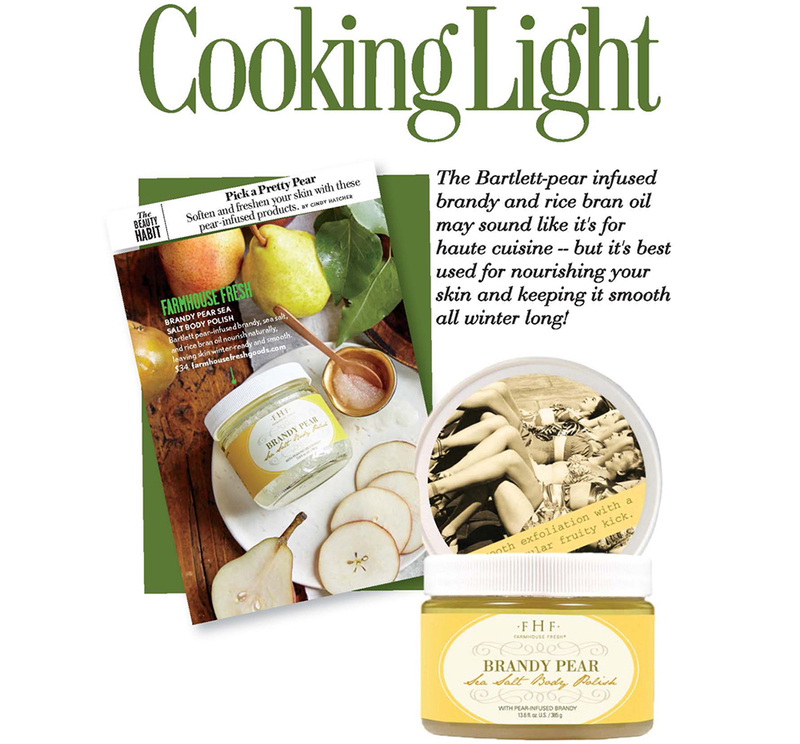 It takes 1 pound of pears, crushed and fermented, to help distill the brandy in each jar of Brandy Pear Body Polish. 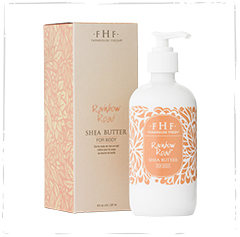 This scrub also includes fine grain sea salt and rice bran oil � so not only are you left fragrant, but extremely soft with a glistening finish on your skin. Pear-infused Brandy, Sea Salt, Cane Sugar, and Rice Bran Oil. Sea salt harvested from U.S. shores. Sodium Chloride (Sea Salt), Glycine Soja (Soybean) Oil, Sucrose (sugar), Ethyl Alcohol (Pear Brandy), Polysorbate 20, Rubus Idaeus (Raspberry) Leaf Extract, Helianthus Annuus (Sunflower) Seed Oil, Oryza Sativa (Rice Bran) Oil, Parfum*, Tocopherol. *Natural fragrance derived from 100% natural sources. 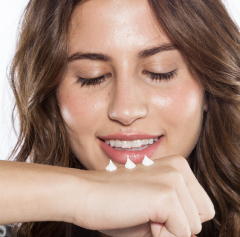 �MAY SOUND LIKE IT�S FOR HAUTE CUISINE � BUT IT�S BEST USED FOR NOURISHING YOUR SKIN AND KEEPING IT SMOOTH ALL WINTER LONG! Ever Eaten a Pear Fresh off a Tree? When I unscrewed the lid of the jar and took my first deep breath of this scrub, the scent immediately transported me back to my days as a little girl playing in my grandparents backyard, where a huge pear tree grew, it's limbs loaded with sweet pears in the summertime. It smelled like someone took all the big juicy pears from that tree, sliced them up and then smooshed them into this little jar! I couldn't believe the strength and purity of the scent. As for the salt scrub itself, the richness of the oil and the fine grain of the salt make you want to truly enjoy this product, turning any bath or shower into a luxury experience. Each time you open that jar, the scent is just as fresh and just as strong, and you feel like that scrub was prepared only moments prior, complete with fresh squeezed pears, no matter what time of the year. It truly IS "Farmhouse Fresh". If I could drink this I would. The scent is light, crisp and warm all at the same time. It is not overpowering...just right. My skin is silky smooth after using the Brandy Pear scrub and I find that I do not need to apply lotion afterwards. Great product.